Note: You can buy a used airplane for about the same price as a new sports car. Riddle: What’s the main difference between the sports car and the airplane? Answer: If you speed up the sports car to about 75 miles per hour and pull back on the steering wheel, nothing very interesting happens. When piloting an airplane, two of your most fundamental duties are (1) controlling the airplane’s speed and (2) controlling its altitude. Performing these duties would be easy if the airplane were equipped with ideal controls, so that you could (1) move a lever that would immediately change the airspeed by a few knots, with no change in altitude, or (2) move another lever that would immediately change the altitude by a few dozen feet, with no change in airspeed. Alas, it is physically impossible to build an airplane with such ideal controls. One purpose of this chapter is to explain how real controls affect the airspeed and altitude of a real airplane. For example, consider the seemingly simple maneuver of changing speed while maintaining a constant altitude. We will see that this requires a complex sequence of adjustments of several controls. There are two ways to deal with this maneuver. One way would be to discover (by trial and error) the required sequence of adjustments, and perform that sequence by rote forever after. A far easier and better way is to understand the fundamental relationships, so that the proper sequence seems logical and obvious. Understanding how the airplane really responds to the controls makes your flying not only easier, but safer as well. Generally, a pilot who tries to control airspeed and altitude separately winds up controlling one or the other rather poorly. Usually it is the airspeed that suffers. All too often, the airspeed gets too low, whereupon the wing stalls and the pilot rather abruptly loses control. This is how the all-too-common stall/spin accident begins. You can stay out of this sort of trouble if you understand what the controls really do. The key to understanding the relationship between airspeed and altitude — and several other things — is the concept of energy. Energy is not a new1 or complicated concept. Most pilots understand that being “high and fast” is very, very different from being “low and slow”; the concept of energy just makes this notion a little more precise and gives it an official name. Good pilots think about energy all the time. The more critical the situation, the more carefully they evaluate the energy before reaching for the controls. Once you grasp the basic concept of energy, you will be able to apply it in many ways, to many different situations. This is a big improvement over trying to figure out all possible situations one by one. Energy gives you the “big picture”. the energy left behind in the air as the plane passes through, stirring the air and leaving it slightly warmer. Energy has the remarkable property that it cannot be created or destroyed. Energy can flow from one region to an adjoining region, and it can be converted from one form to another ... but the amount of energy remains the same. This rule (which physicists call the law of conservation of energy) is not one of Newton’s laws; it was not even known in Newton’s day. Consider the analogy with freezing water: liquid water can be converted to ice and back again, yet the amount of H2O doesn’t change in the process. Similarly, if some water leaks away and we lose track of where it is, the number of H2O molecules hasn’t changed. 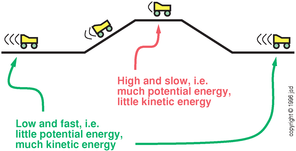 Similar3 notions apply to energy, as illustrated in figure 1.1. Fuel energy can be converted to altitude; altitude can be exchanged for airspeed; altitude can be cashed in to pay for drag; et cetera. The amount of energy doesn’t change. The energy is just converted from one form to another. Some of these energy conversions are irreversible. Fuel burn, for example, is a one-way street; we cannot (alas) operate the engine backwards and replenish the fuel supply. Similarly, when energy is dissipated by drag, there is ordinarily no way for the airplane to recapture that energy. The airspeed and altitude together are called the mechanical energy. Engine power increases the mechanical energy, while dissipation decreases the mechanical energy. Airspeed, altitude, and fuel are forms of onboard energy. Drag causes energy to go overboard, into the airmass. See section 19.12.3 for some clarification of what we mean by dissipation and irreversibility. During power-off glide, altitude is being cashed in to pay for drag. The airspeed is not changing, and no energy is being taken from the fuel tank. During climb, fuel is being consumed to pay for drag and to purchase altitude. During cruise, fuel is being consumed to pay for drag. Altitude and airspeed are not changing much. If you pull back on the yoke, the airplane will slow down and zoom upward. If you do it quickly enough, drag will not have time to consume very much energy, nor will the engine have time to convert very much fuel. Conversely, if you push forward on the yoke, the airplane will speed up and descend. Once again, if you do it quickly enough, drag and engine power will not affect the energy budget very much. During the early part of the takeoff roll, drag is negligible. There is no change in altitude, so virtually all engine power goes toward building up airspeed. An important conversion is the flare maneuver, which occurs at the end of every flight. It is possible to maintain altitude without using the engine, by gradually cashing in airspeed to pay for drag. Figure 1.2 through figure 1.8 show several examples of how one form of energy can be converted to another. We now investigate energy-conversion processes in a little more detail. An airplane (like any other object) has potential energy proportional to its altitude. Every increment of altitude represents an increment of energy. Similarly, any moving object has kinetic energy proportional to the square of its speed. We can easily convert back and forth between these two forms of energy. A roller-coaster is a well-known4 example of this, as illustrated in figure 1.9. At the left of the figure, we have a roller-coaster at a low altitude, moving quickly. In the middle of the figure, the roller-coaster has a higher altitude, but much less speed. At the right of the figure, the roller-coaster has returned to the lower altitude and regained its speed. Since the roller-coaster carries no fuel and has very little friction, potential energy (altitude) and kinetic energy (speed) are the only forms of energy we need to take into account. This law applies to airplanes, roller-coasters, or anything else that converts potential energy to or from kinetic energy. The altitude gain is proportional to (a) the amount of airspeed loss times (b) the average airspeed during5 the maneuver. Let’s apply this to a couple of examples: if you are cruising straight and level at 201 knots, and you pull back on the yoke, when you reach 200 knots you will have zoomed up 18 feet. If you started at 101 knots and pulled back to 100 knots (once again a loss of one knot) you would only gain 9 feet. This rule applies in any situation where friction can be neglected. The conversion factor, 9 feet per knot per hundred knots, is just the reciprocal of the acceleration of gravity6 expressed in aviation units. The two forms of energy — altitude and airspeed squared — are deeply related, even though they are measured in different units. We need a conversion factor (9 feet per knot per hundred knots) so we can convert from one set of units to the other. Since we are about to start comparing these mechanical forms of energy with other forms, we must start paying attention to an additional detail: an object’s potential energy depends not only on its altitude but also on its mass. A 300-ton Boeing at any given altitude has 300 times more potential energy than a 1-ton Piper at the same altitude. Similarly, an object’s kinetic energy is also proportional to its mass. A 300-ton object at any given airspeed has 300 times more energy than a 1-ton object at the same airspeed. Since the mass of an airplane does not usually change much during the course of a maneuver, we can often simplify the discussion by ignoring the distinction between “energy per unit mass” and genuine “energy”. In cases where the distinction matters, I will remind you of it. Energy per unit mass is also called specific energy. Two aircraft at the same altitude have the same specific potential energy, and two aircraft at the same speed have the same specific kinetic energy, even if their masses are wildly different. Having understood the conversion between altitude and speed, let’s bring fuel into the picture. Each pound of fuel contains a certain amount of chemical energy. The engine allows us to convert this chemical energy to mechanical energy. An example of this is shown in figure 1.10. First we fly straight and level for ten minutes, maintaining 90 knots; we observe the fuel flow gauge is reading 5 gallons per hour. Then we open the throttle and climb for the same amount of time at the same airspeed; we observe a vertical speed of 630 feet per minute and a fuel flow of 11 gallons per hour. We conclude that climbing 6300 feet takes 1 gallon more fuel than level cruising for the same amount of time, in a typical one-ton airplane. A heavier plane would require proportionately more fuel for the same climb. We could try to quantify the conversion factor for converting fuel to altitude, but it wouldn’t be worth the trouble, because it turns out to be quite sensitive to factors such as engine efficiency. In our example, the level cruise was conducted at maximum efficiency using a fairly lean fuel/air mixture, whereas the climb was conducted at much lower efficiency due to a much richer fuel/air mixture. We have made a trade-off. It would be nice if the airplane were 100% efficient at converting fuel to altitude — but in practice it is hard to build an engine with high efficiency, high peak power, small size, light weight, low cost, small cooling drag, et cetera. Since fuel corresponds to altitude, fuel flow rate must correspond to rate of climb. Airline crews use this fact routinely: to make the transition from level flight to a 500 fpm descent at constant airspeed, they just retard the throttles until they see a certain reduction on the fuel flow gauges. This notion of “energy per unit time” is officially called power. You don’t want to confuse power with energy, any more than you would want to confuse a vertical speed indicator with an altimeter; the former indicates altitude per unit time, while the latter indicates altitude. The airplane has instruments that measure most — but not all — of the relevant forms of energy and power. The energy gauges include the altimeter, airspeed indicator, and fuel gauges. These tell you how much potential energy, kinetic energy, and chemical energy there is on board. The most common power gauges include vertical speed indicators and fuel flow gauges; these tell you at a glance how much power is flowing in and out of the potential and chemical reservoirs. Sometimes other power gauges are installed; gliders often have a “total energy variometer”, which measures the rate of change in mechanical energy (potential plus kinetic) by measuring a combination of altitude change and airspeed change. Such a device is more useful than an ordinary vertical speed indicator for detecting updrafts, for the following reason: Inadvertently pulling back on the yoke will cause a positive indication on the vertical speed indicator (by the law of the roller-coaster) which might be confused with a real updraft; pulling on the yoke will cause no indication on the TE variometer. Since the glider has no engine power to worry about, the TE variometer gives a reasonably complete picture of how much power is flowing in or out of the aircraft (updraft = power in; dissipation = power out). In an airplane with an engine and without a TE variometer, it is somewhat trickier to visualize what is going on. Figure 1.11 summarizes this section by showing the various forms of energy and power, and some of the relationships between them. Gauges exist that will tell you some but not all of these quantities; you have to infer the others. A reminder for the purists: a given quantity of gasoline contains a certain amount of chemical energy, period. In contrast, a given amount of altitude represents a certain amount of energy per unit mass of airplane. Therefore it is a slight oversimplification to suggest (as in figure 1.11) that the fuel gauge and the altimeter measure exactly the same thing, but there is no harm in it if the mass of the airplane isn’t changing. Similar remarks apply to the airspeed indicator. The time has come to bring drag into the picture. Drag is related to power, or rather the opposite of power. In steady flight, power is needed to overcome drag, as discussed in section 4.5. Energy is like money. Energy in the form of altitude is like money stored in a convenient place. Climbing to altitude requires energy, but you pay this cost only once. If desired, you can cash in the altitude (energy) to do useful things. You need power to overcome drag. This is like rent. You have to pay a certain amount of energy per unit time (i.e. power) for the privilege of flying the airplane through the air. That energy can never be recovered. Roughly speaking, the amount of drag — the amount of rent you have to pay — depends on airspeed. This is only approximately true, but it’s the traditional way for beginners to think about things, and it’s good enough for present purposes. For the next level of detail, see section 2.11. In the figure, the horizontal axis is labeled in units of Knots of Indicated Air Speed (KIAS). A knot is a nautical mile per hour, as discussed in section 14.2.2. The meaning of indicated (versus true) airspeed is discussed in section 2.13. Meanwhile, the vertical axis is labeled in units of vertical feet per minute (fpm). This makes sense, because in the cockpit, it is practical and conventional to think in terms of vertical speed. There is a vertical speed indicator on the instrument panel. This is consistent with choices we made in previous sections: We have seen how to think of airspeed in terms of altitude (9 feet per knot per hundred knots) and also how to think of fuel in terms of altitude (6300 foot-tons per gallon), so it is only logical that power should be measured as vertical speed; that is, altitude-change per unit time. Strictly speaking, vertical speed is not quite the same thing as power, for the same reason that altitude is not quite the same thing as energy. However, such distinctions are usually not worth worrying about (assuming the mass of the airplane is not changing). On the rare occasions that the distinction matters, we will mention it. As shown in figure 1.13, the power curve is divided into three regimes. Front Side: The right-hand part of the curve (from moderate airspeeds on up) is called the front side of the power curve. Normal cruising flight is conducted in this range of airspeeds. In this regime, the faster you go, the more power is consumed by friction aka parasite drag. This is completely unsurprising — everybody knows that moving an object through the air quickly takes more force than doing it slowly. You can see in figure 1.13 that if you glide at a very high airspeed, you will have a large rate of descent. In the mushing regime, the airplane supports its weight by visiting a small amount of air and yanking it down violently. This creates strong wingtip vortices, resulting in relatively large amounts of induced drag, as discussed in section 3.14.3. 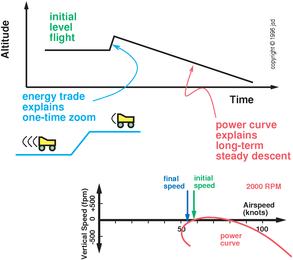 On the front side of the power curve, the airplane supports its weight by visiting a large amount of air and yanking down on it relatively gently. This creates relatively weak wingtip vortices, resulting in relatively little induced drag. Therefore if you are in the mushing regime, flying at a lesser airspeed causes a greater descent rate, as can be seen in figure 1.13. This is quite unlike cars — a slow-moving car incurs very little frictional loss. Of course, cars don’t need to support their weight by pulling down on the air. Stalled Regime: Finally, we consider the extreme lower-left part of the power curve. This is called the stalled regime, as indicated in figure 1.13. Flight in this regime is very, very peculiar. The mushing regime and the stalled regime are collectively referred to as the back side of the power curve. Remarks: The power curve is so important that there is no good way to explain the details all at once. Therefore the plan is to introduce the idea in this section, and then revisit it later sections. For the next level of detail on this, see section 2.11 and section 7.5. Life would be simpler if manufacturers would explicitly show the power curve somewhere in the POH, but they don’t. You have to figure it out for yourself. Fortunately, the general shape of the power curve is more-or-less the same for all airplanes, so the concepts discussed here are very widely applicable. There are, however, slight variations from plane to plane, so you might want to map out a customized power curve for your favorite airplane, as discussed in Section 7.6. Figure 1.12 and figure 1.13 are restricted to the case of straight-ahead flight at zero engine power. If the engine power is nonzero, the power curve is shifted, as shown in figure 1.14. The point at the boundary between the mushing regime and the stalled regime has a number of special properties. Among other things, it is the leftmost point on the power curve. The corresponding airspeed, the lowest airspeed, is called the stall speed. For more about this, see section 5.3.2. Warning about terminology: When pilots talk about “the stall”, sometimes they are talking about the one special point at the boundary between the mushing regime and the stalled regime ... but sometimes they are talking about the stalled regime as a whole. For the next level of detail on this, see section 2.11. An airplane can very rapidly and efficiently convert airspeed to altitude, and vice versa. Because of this, these two forms of energy are often considered together, and are collectively referred to as the mechanical energy. In contrast, it is difficult to convert fuel to mechanical energy quickly, and it is difficult to dissipate large amounts of mechanical energy via drag quickly (especially while maintaining a safe airspeed). A rapid conversion of airspeed to altitude is called a zoom — a fairly common maneuver.8 You should always be careful when performing a zoom, because if the airspeed gets too low there could suddenly be very unpleasant consequences. The airplane’s ability to convert airspeed to altitude and back again is the key to many aerobatic maneuvers. There is no way you could perform a loop using engine power alone; you have to zoom. Bob Hoover’s airshow routine typically closes with a spectacular energy management demonstration. After shutting down the engine, he performs a series of complex aerobatic maneuvers, including an eight-point roll and a hammerhead.9 He then returns for landing and coasts to the reviewing stand, all without restarting the engine. It is quite a fascinating lesson in pilot technique. The previous section introduced the main forms of energy that affect flight. The next step is to discuss how the pilot can control the energy in various ways. This section doesn’t introduce very many additional concepts; it mainly just combines and applies the concepts introduced previously. We continue to use the analogy between energy and money. Therefore, deciding how much power should flow from one reservoir to another is called the power budget. Figure 1.14 shows how engine power contributes to the overall power budget.10 The bottom curve applies when the engine is operating at 1700 RPM, the middle curve applies at 2000 RPM, and the top curve applies at 2300 RPM. Point A indicates a 500 fpm descent at 80 knots. Point B indicates level flight at the same airspeed, and point C indicates a 500 fpm climb still at the same airspeed. The rule is simple: if the engine produces more power, the airplane will descend at a lesser rate or even ascend. Point D corresponds to level flight at 110 knots. The throttle setting is the same as at point C — but the energy that was being used to purchase altitude (point C) is now being used to pay for the higher drag at the new airspeed (point D). If engine power exactly equals frictional losses, the airplane will stay level — fuel energy is being used to pay for the friction. Reduce power by 3” of manifold pressure (for a constant-speed prop). This rule works surprisingly well over quite a range of different makes and models. Make a point of learning whichever version of this rule applies to your airplane. It is a big improvement over blindly guessing at throttle settings. Power is needed to overcome drag. Flight at speeds above or below VY requires more power than flight at VY. Climbing requires more power than level flight, other things being equal. Speeding up requires more power than unaccelerated flight along the same path. Non-pilots commonly think engine thrust will cause the airplane to speed up, but usually that’s not what happens. Although the airplane is being pulled forward, the trim mechanism notices what is going on and immediately converts the new energy to altitude. Therefore the throttle can be reliably used to control up/down motion. As discussed in chapter 6, this is the normal, natural aerodynamic behavior. During the takeoff roll, the airplane is not free to move in the vertical dimension, so the trim has no effect. Therefore (in this special situation) energy coming from the engine is converted to speed, not altitude. Similarly, suppose your autopilot is manipulating the yoke so that the airplane maintains level flight. This means the natural aerodynamics of the trim mechanism is irrelevant. When you open the throttle (in this special situation) the added energy will be converted to airspeed, not altitude. Note that the autopilot has to move the yoke to make this happen — so we can reasonably say that the airspeed change is “caused” by the yoke movement more directly than it is “caused” by the added power. I reiterate that in flight, if you (and the autopilot) leave the yoke and trim alone, opening the throttle just makes the airplane climb. If you want to change airspeed without an altitude excursion, you will need to adjust the throttle and the yoke, as discussed in section 7.2. A car, of course, will speed up when you open the throttle. However, this has got nothing to do with the behavior of an airplane in flight. An airplane is not the same as a car. Cars don’t have trim. Cars aren’t free to move in the third dimension. Now that we understand the effects of opening the throttle, the effects of closing the throttle should be no surprise. The airplane will maintain its trim speed (or possibly speed up very slightly) and descend. This is easy to understand in terms of energy; compare points B and A in figure 1.14. If engine power is reduced, the only way to pay the rent is to cash in altitude energy at a steady rate. You will slow down. Think of this as the primary effect.14 The new, lower airspeed will persist throughout the short term and the long term. Because of the decrease in airspeed, you will zoom upwards. This is a short-term, one-time increase in altitude, according to the law of the roller-coaster. You are trading in kinetic energy, exchanging it for potential energy. At the new airspeed, you will be operating at a new point on the power curve. If this is a more-efficient operating point, you will get a long-term climb. If this is a less-efficient operating point, you will get a long-term descent. Let’s clarify the long-term behavior by considering two versions of this experiment. 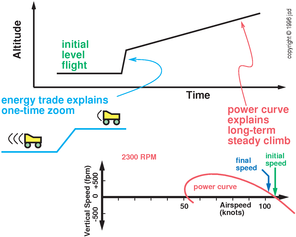 In the first version, as illustrated in figure 1.15, the airplane is initially on the front side of the power curve — cruising at 105 knots, which is definitely on the front side of the power curve. Pull back on the yoke a little, and hold it. What happens to the airspeed and altitude?15 The first thing that happens is that the airplane slows down from 105 knots to 100 knots. You should think of this as the primary effect of moving the yoke. This is a short-term and long-term effect. As a first consequence of this speed change, the airplane will zoom up about 45 feet, according to the law of the roller coaster: 9 feet per knot, per hundred knots. This is a short-term, one-time effect. As a second consequence of the speed change, the new speed sits at a more-efficient place on the power curve. Less power will be consumed by drag, so the airplane will ascend. (Remember we’ve kept the engine power unchanged.) The airplane will continue to climb at a steady rate for a long time. The short-term altitude change is governed by the law of the roller-coaster, while the long-term altitude change is governed by the power curve. So far this all seems pretty normal — but the second version of the experiment is much more interesting, as shown in figure 1.16. Let’s reconfigure the airplane for flight on the back side of the power curve — say 58 knots. Trim the plane for straight-and-level flight, then pull back on the yoke a little and hold it there. The first part of the story is the same: you will slow down. Let’s say the new speed is 53 knots. As always, you should think of this as the primary effect: if you pull back on the yoke you will slow down. The second part of the story is also the same: there will be a one-time increase in altitude. This time it will be about 25 feet. The zoom is less than in the previous case, because the initial airspeed was less. The final part of the story contains the surprise: because the new airspeed represents a higher-drag (less-efficient) point on the power curve, the airplane will enter a steady descent. At the new airspeed, it will descend and descend and descend. As always, the short-term altitude change is governed by the law of the roller-coaster, while the long-term altitude change is governed by the power curve. This scenario (a short-term ascent followed by a long-term descent) is called a zoom.16 It is the bane of student pilots when they start learning to perform landings. Starting from a low airspeed a few feet above the runway, they pull back on the yoke The airplane obediently zooms upward, then (alas) descends at a tremendous rate and makes an airplane-shaped hole in the runway. Students who have not been taught the distinction between the short-term and long-term effects have a hard time figuring out this situation. Note: this treacherous behavior (short term ascent followed by long-term descent) does not imply that the airplane is stalled or about to stall. As mentioned in section 1.2.5, the mushing regime is not the same as the stalled regime. In the mushing regime, induced drag is the culprit; stalling is a completely different issue, which is discussed in chapter 5. The following observation may help put into perspective the sizes of the various energy reservoirs. First, consider normal cruising flight: the energy in the fuel tank is enough to “pay the rent” (overcome drag) for several hours. Second, consider a power-off glide: starting from a reasonable cruising altitude, altitude energy can be cashed in to pay the rent for several minutes. Finally, consider the flare maneuver: it is possible to arrest a power-off descent and maintain level flight by cashing in airspeed for a few seconds. You can pay for drag by cashing in fuel … for a few hours. You can pay for drag by cashing in airspeed … for a few seconds. So, we see that the available energy reservoirs have very different sizes. This difference in sizes has many consequences, but the most important one is this: you cannot make large altitude corrections (only small ones) by borrowing from the airspeed reservoir. That is, suppose you are a few feet below your desired altitude. The quickest way to get back up is to pull back on the yoke. You thereby cash in some airspeed energy to buy altitude, according to the law of the roller-coaster. On the other hand, if you try to go up some more by pulling back some more, you will very soon run out of airspeed. The bottom line is: you should feel guilty about borrowing energy from the airspeed reservoir. There just isn’t very much energy there to begin with, and letting the airspeed get too low can have serious consequences. The pros and cons of controlling altitude by borrowing airspeed are discussed in more detail in chapter 7. The next step is to combine what we know about energy and develop general rules for energy management. Let’s consider the four situations depicted in figure 1.17. 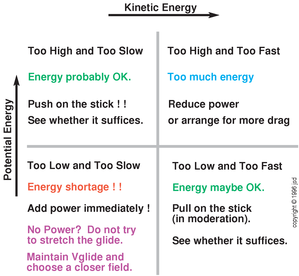 In the figure, as we go from left to right the kinetic energy increases; similarly as we go from bottom to top the potential energy of the situation increases. Let’s start by considering the situation in the upper-left corner: the altitude is a bit high and the airspeed is a bit low. If we’re lucky, the total energy might be about right. Therefore, the obvious thing to do is to push on the yoke. That will get rid of some altitude by converting it to airspeed, which is basically what we want. In the lower-right corner we have the complementary scenario: the altitude is a bit low and the airspeed is a bit high. Once again, if we are lucky the total energy might be about right. Therefore, the obvious thing to do is to pull on the yoke (in moderation). That will convert some of the excess airspeed into altitude, which is basically what we want. The situation in the upper-right corner is more challenging: both the airspeed and the altitude are too high. Unlike in the previous two scenarios, we clearly have an energy problem: the total energy is too high. There is nothing you can do with the yoke that will make the altitude better without making the airspeed worse,19 and vice versa, so we have to find something else to do. The first step is to retard the throttle, the sooner the better; every bit of power that the engine produces only adds to the energy problem. The other way to get rid of energy is to increase drag. This can be done by extending the landing gear, extending the flaps, slipping, et cetera. Over time, the increased drag will take energy out of the system, which is what you want. If drag is not taking energy out of the system fast enough, you may have to perform a 360 degree turn or something in order to buy some more time. Finally, let’s consider the lower-left corner of figure 1.17. In this case, both the airspeed and the altitude are too low. You have an energy problem, namely too little energy. This is even worse than having too much energy, because you have fewer options for fixing the problem. You should open the throttle immediately; this will (over time) convert some fuel energy into new airspeed and/or altitude. If no power is available, do not try to “stretch the glide”. There is nothing you can do with the yoke that will add new energy to the system; all you can do is minimize the loss by maintaining the canonical best-glide airspeed. Since you are too slow, push on the yoke to re-establish that airspeed. Since you are too low, choose a closer place to land. Never try to stretch the glide. See chapter 7 for a continuation of this discussion of energy management and proper usage of the yoke and throttle. See section 19.12 for some fine points about conservation, energy, entropy, dissipation, and irreversibility. • Less drag. • More engine power. Suppose you are on final approach for landing. You notice that you are below the glideslope. What should you do? Add power?? Pull back on the yoke?? — This is asking the wrong question. The glideslope indication alone doesn’t give you enough information to decide what to do. You need to perceive the airspeed as well as the height. Think about your energy: potential energy plus kinetic energy. Being low and slow is very different from being low and fast. Instructors: on final, ask your students “Are we high or low, fast or slow?” Make sure they evaluate the energy situation continually and correctly. Altitude and airspeed tell you your total mechanical energy. In the short run there is nothing that will change the total mechanical energy; all you can do is use the yoke to trade energy back and forth between altitude and airspeed. The conversion factor is nine feet per knot, per hundred knots. 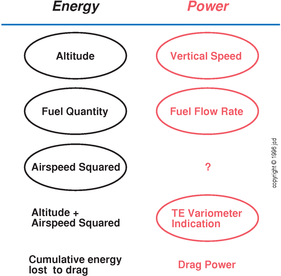 In the long run, the throttle (engine power) and the power curve (drag power) control the rate at which energy is entering and leaving the “airspeed plus altitude” system. To establish a long-term climb, add power and/or trim for a speed closer to VY. To overcome drag (in unaccelerated level flight) requires power. To climb (while maintaining constant airspeed) requires added power. To speed up (while maintaining constant vertical speed) requires added power. The amount of energy in the airspeed reservoir is very small compared to the energy in the altitude reservoir, which is in turn very small compared to the energy in the fuel reservoir. If you value your life, look at the airspeed indicator before pulling on the yoke. Looking at just one indicator (altitude or airspeed) for making a decision about just one control (yoke or throttle) is poor pilot technique and could well lead to a stall/spin accident. You must look at both indicators, size up the energy situation, and then decide what to do with both controls. The ideas of energy, kinetic energy, and potential energy were understood within the physics community by the mid-1800s, based on roots going back even farther than that. Wolfgang Langewiesche explained the importance of energy to pilots. In his 1944 book, reference 1, he didn’t actually use the word “energy”, speaking instead of “zoom” and “roller coasters”, but energy by another name is still energy. John Boyd (reference 2) advocated his Energy-Maneuverability (“E-M”) theory within the US Air Force, beginning about 1963. For instance, solar energy can produce updrafts and windshears. Sometimes the airplane’s ability to extract energy from these is important, as discussed in section 7.5.7 and section 16.18.2. The analogy between water and energy is only approximate. Water molecules can be created from scratch by chemical processes, for instance by burning hydrogen or hydrocarbons. Sometimes water-creating and water-destroying reactions are negligible, in which case we can treat water as being approximately conserved. Meanwhile, energy is always exactly conserved. There are no processes whatesover that create or destroy energy. Langewiesche (reference 1) devotes an entire chapter to “The Law of the Roller Coaster”. To be exact: Take the initial airspeed and final airspeed and average them. ... that is, g = 9.807 meters per second per second; 1/g = 8.8537 feet per knot, per hundred knots. a more precise definition of VY will be given in section 7.5. The reverse conversion, altitude to airspeed, is equally common but does not have a correspondingly colorful name. A hammerhead involves flying vertically upward until the airspeed is practically zero, yawing the airplane 180 degrees to point the nose downward, and then retracing your steps vertically downward. This is slightly idealized. See section 7.5 for more details. The rare exceptions are discussed in section 6.1.6. ... in conjunction with the RPM control if you have a propeller governor. Having a particular pitch attitude is rarely an end in itself. Instead, you should use it as a good means of controlling other things, such as angle of attack; see section 2.6 and section 2.10. Also note that abrupt movement of the yoke will provoke phugoid oscillations, as discussed in section 6.1.14. The aerodynamics of how the yoke and trim govern airspeed is discussed in chapter 6. Again, note that discussion of pitch changes is being postponed until section 2.6. Some older books call it “ballooning”. ... unless you pull back very, very slowly, in which case the short-term ascent might be masked by the long-term descent. Similarly, in the mushing regime, other controls (such as the ailerons) become less effective, but they do not reverse. ... in the short run, at least — but see section 7.7.1.